“The sleeper novel of the summer…With writing so sharp you could stab your finger on it, Rules of Civility draws the reader into an exploration of love and timing, friendship and betrayal, class and money, all played out among brilliant dialogue and quick plotting…the writing is so luxurious, veering from playful to piercing, that the reader slows to savor every sentence…Brilliantly, Towles captures a specific era in pre-war Manhattan, burnished with universals of youth and promise and the world awaiting. Rules of Civility certainly flashes a Dorothy-Parker-ish zip, but what give it soul is a hovering Fitzgerald-like maturity, at once pensive and poignant. “If you are a reader who picks up “Rules of Civility” by Amor Towles and the book doesn’t make it onto your Top Five list of novels read in the past three years, I’m going to be very worried about you. Rules of Civility… is a book of amazing depth. 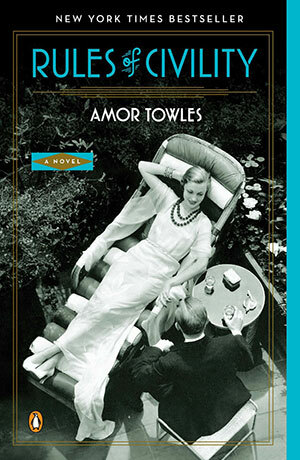 In this, his first novel, Amor Towles reveals an exceptional flair for character development. Whether unveiling fresh insights into protagonists like Katey or Tinker or evoking the inner lives of secondary characters like Nathaniel Parish, the gentlemanly, old school editor who gives Katey her start in the publishing world, Towles’ command of human dynamics never falters.